Each of the 32 red dots represents an author of one or more GP entries in the genetic programming bibliography who is connected by being listed as a joint author with one or more entries with another person in the graph. Everyone is shown here. Lines connect coauthors. (To reduce clutter only links to first author are shown.) 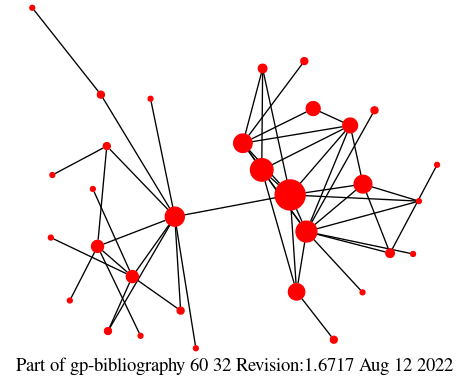 The area of each dot indicates the number of entries. This graph contains 58 entries of the total of 11634.